It's Fast. It's Easy. It's Secure. myClinicOnline is a secure way for patients of our Community Health Centers to track non-urgent aspects of their care at any time. 1. Let us know you would like to enroll. Send us your request or call us at 970-879-1632 in Steamboat Springs or 970-824-8233 in Craig. You will receive a username and password during your visit or via email. You can change this password when you first log in. 2. Go to myClinicOnline. Enter the username and password you received from us. Follow instructions to change your password. Keep your log in details private. 3. 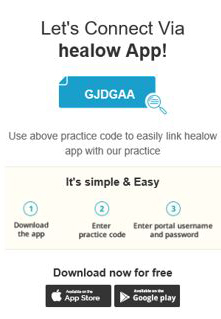 Once registered, you can access myClinicOnline on your mobile device via the healow app. When you have the app. use code GJDGAA to link it to myClinicOnline. Email us or call 970-879-1632 in Steamboat Springs or 970-824-8233 in Craig (email address should not be use for urgent medical situations or to discuss private health information).